SCD Group is relocating its office. During this transition, Steve is revisiting some former blogs. For the last three months, we've lived in an active community of two or three thousand people. 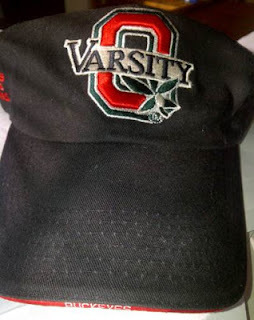 I wear this Varsity O hat at all our events. It drives my wife a bit crazy to see me in the same hat day after day. Yet, I keep wearing it. Why? Well, I wear it a bit to brag since only those who have played a varsity sport at Ohio State can get one. I also wear it because it starts conversations (usually around athletics or where I'm from). And, I wear the hat because it has become my brand. People around here recognize me because of my hat. On March 1, I wrote How Do Prospects/Members/Donors Know it is You? Thoughts on Branding. The other day, I saw a photo (visual) in the newspaper and knew immediately it was Larry the Cable Guy. Crazy but why do I remember this guy? The sleeveless (and usually plaid) shirt. Sitting in the airport last Saturday, I noticed a huge number of people wearing logoed clothing that identified themselves with their team, cause, city, company. Rather than a team or cause, some were unpaid walking billboards for “cool” apparel companies. In 35 minutes, I saw hats, t-shirts, jackets and bags promoting a whole range of "associations." What is your association's brand? Do your members "wear" it and start conversations about your organization?